Please note that the entrance fee is CASH ONLY! Please look for the Kids' Zone at the back of the curling rink. 2019 schedule is pending and will be posted when finalized. We will have Boys and Girls Club of Cochrane supporting our Kids Zone along with the Town's Block Party Trailer. There will be a face painter, and, of course, our furry friends from Butterfield Acres. To view a list of the 2019 year's exhibitors, click here (subject to change). To view the 2019 floorplan, click here (subject to change). Click here to view more details on the EVENTS PAGE for the Cochrane Chamber Tradeshow. If interested in donating a door prize or coupons, please contact the Chamber at c.business@cochranechamber.ca or call (403) 932-0320. Donating a product or service from your business is another great way to market your business! It is not a requirement to be a Booth Vendor in order to participate. 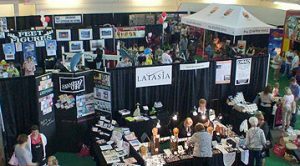 The Cochrane Trade Show is the largest annual event in town! Last years' Trade Show was another sell-out and we expect no less for this year! The Trade Show will take place on Saturday, May 4th and Sunday, May 5th 2019 at the Spray Lake Sawmills Family Sports Centre. As a consumer show, the event has over 140 local exhibits ranging from home based businesses to products and services offered at retail stores. The show has attractions for all ages, and many interactive displays, as well as family/children entertainment. Public admission grows each year with expectations of 2800 to 3000+ people visiting the show. This is your chance to Shop, See, Save and get to know the local retailers and professional service companies in town, all in one convenient location. Products range from: Household appliances to real estate, clothing & accessories, recreational products and much much more! Services include: Financial planning, health & beauty, exercise & wellness, home renovations, home décor and landscaping. Various non-profit organizations will also be showcasing their talents and ways they support the community at large. If you are interested in volunteering with any of these special groups, here is your opportunity to find out more about each of them. No matter what aspect of the show you participate in (general admission or booth vendor), it is sure to be a great experience for everyone! Come out to the show this year and help support the businesses in Cochrane. This show has something for everyone, so bring the whole family! Come to the show to be entered for daily prizes, enjoy family entertainment, samples, and so much more. Don’t forget to check the website for updates!